We’ve been on quite the content curation journey! I hope you have been following along. If you are just now joining us, we started with defining what content curation is, why it is important, and moved along through the series into other topics such as understanding what kind of content businesses should curate, how to find content to curate, and content curation platforms. Today we are going to explore how local businesses can share the content they have curated. As I shared in part one in the series, content curation is one of many content strategies a local business can employ to keep their audience engaged and attract search engines by sharing others’ content. It’s important to disclose here that content curation is just one strategy within a content marketing plan that a local business can leverage. Ideally, the plan would include the business creating their own content along with leveraging content curation. By this point in the series, you have likely realized the local businesses you represent have been curating content all along, but just didn’t put a name to it. They probably didn’t have it defined as part of their content marketing process and perhaps weren’t super particular about what kind of content they curate. Maybe they have been curating content, but only employing one method versus the many available to them. Let’s get into the content curation methods now. One of the most common methods of content curation is the sharing of content on social media platforms. Businesses will often share a mix of content they create along with content others have created. Please keep in mind content is more than just an article — videos, GIFs and images are also content mediums. So, if the local business is sharing a popular GIF on social media that they did not create, that is content curation. At Advice Local, we curate content on our social media that was created by industry leaders, our partners and friends in the industry. 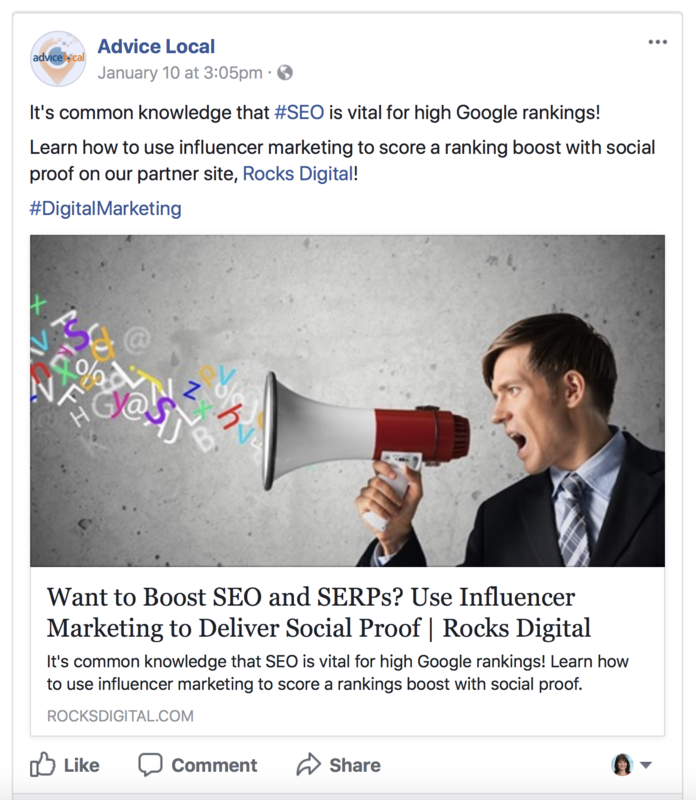 Here is an example of an article we shared that was created by one of our partner sites, Rocks Digital. Tagging their page makes it easier for those that follow our page to click over to the Rocks Digital page, review their other social media posts, and potentially elect to “Like” their page. Tagging their page notified them to review what was shared from their site. Facebook Newsfeed reach expands as more users engage with a post. The admin for the Rocks Digital page will most likely review the social media update on the Advice Local page, like and comment. This will assist in further increasing our organic reach to our audience. Sharing others’ content encourages them to share more content. Rocks Digital will most likely share one of our articles to their followers within the coming weeks. So, by curating their content, they will most likely now curate some of ours. In part three, where I discussed how to find content to curate, one of the examples was subscribing to others’ emails and newsletters. I also went into detail on how we curate content and distribute it through our weekly email. This is an easy way to keep a local business’ audience engaged with minimal effort. Here is an example of the “From Around the Web” section of the Advice Local weekly email. As you can see above, this is the section of the Advice Local email newsletter where we demonstrate our own content curation. Part of our process is to write a brief blurb about the articles we have chosen to include in the weekly email. We summarize what the reader will learn if they click the link to read the article. With so many articles about our industry published each week, it can be difficult to determine which articles to share. We try to select the ones that are the most important to our audience, with the most valuable and accurate perspective. 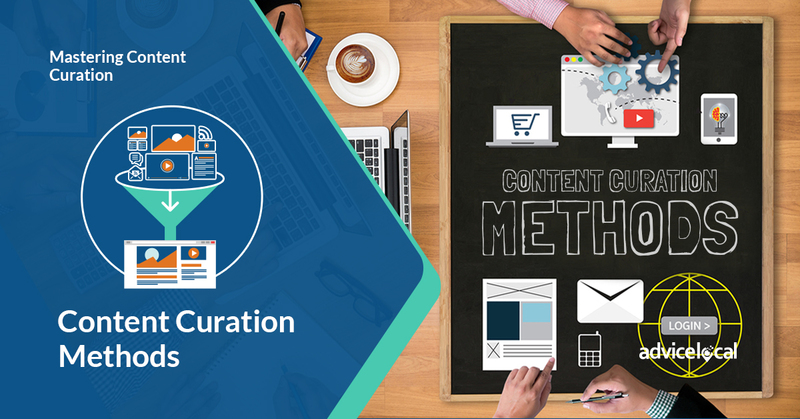 It will be important for local businesses using this content curation method to have a standard set of guidelines that are adhered to during review. As mentioned earlier, search engines favor websites that are producing new content on a regular basis. Much like the process we use for the Advice Local newsletter, local businesses can gather the relevant content created by others, write a brief summary about each piece of content and share on their blogs in the form of an article. Since the business is sharing content created by others, they would link to the original source for the reader to review the full article. Sometimes those who curate content will take the entire article published on another’s website and share to their own. This is NOT the type of curation I am referring to or recommend. 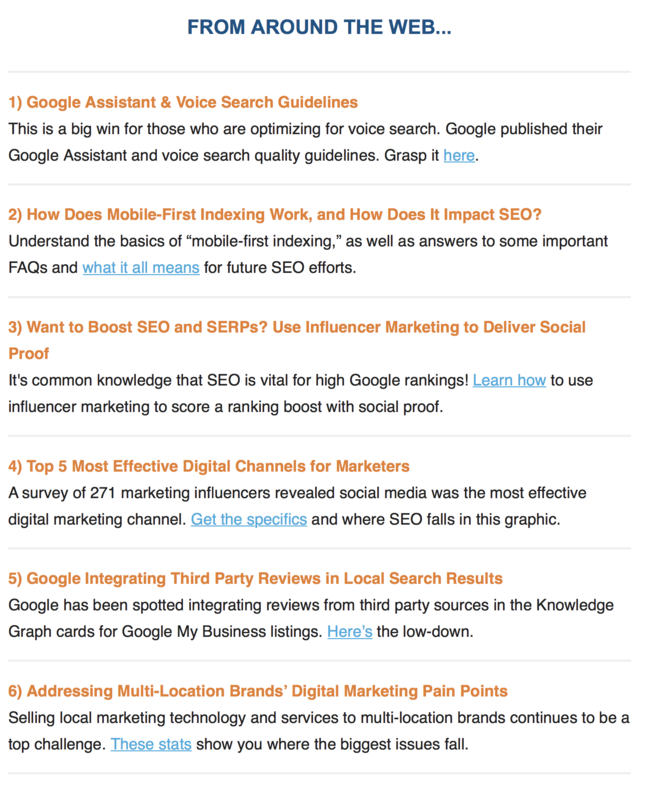 Here is an example of an article created by Local Search Association (LSA) where they are curating others’ content. 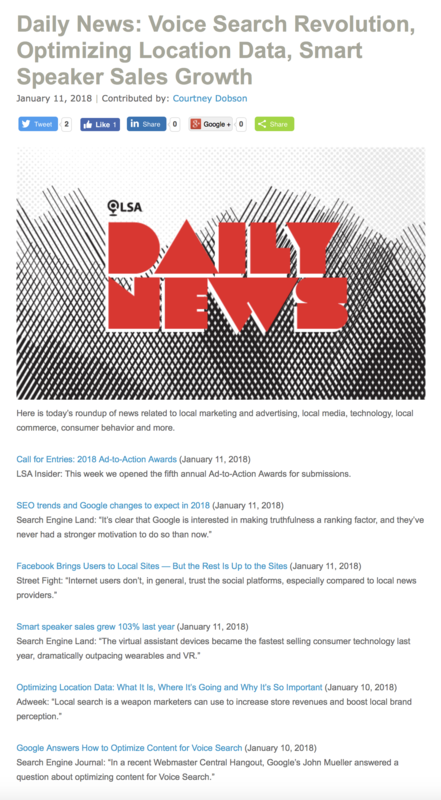 Each day, the LSA Insider produces an article where they have gathered what they deem as “Daily News” and share it on their blog with their readers. Notice they just add a tiny blurb about each piece and cite the source for the article along with a link for the reader to access the full article. Personally, I would recommend the local business add an additional sentence or two and integrate their own unique thoughts on the topic. After all, to keep the reader coming back versus going straight to the originator website, there needs to be an additional added value. Most local businesses considering this method of content curation should start with one article a week, then build up to something as aggressive as a daily compilation. LSA has quite the reader base, so people look to their content daily for these type of wrap-up posts. In part four of the series, I highlighted content curation platforms a local business can use to find content to curate and lightly mentioned how many of these platforms allow for a business to gather followers and subscribers. Ideally, businesses would personally curate the content publishing under their brand, but there are some instances where it’s acceptable to use an automation tool to do this. Content curation platforms like Scoop.it or Paper.li include search features that track down and assemble relevant content for the business based on keywords the business enters into the platform. 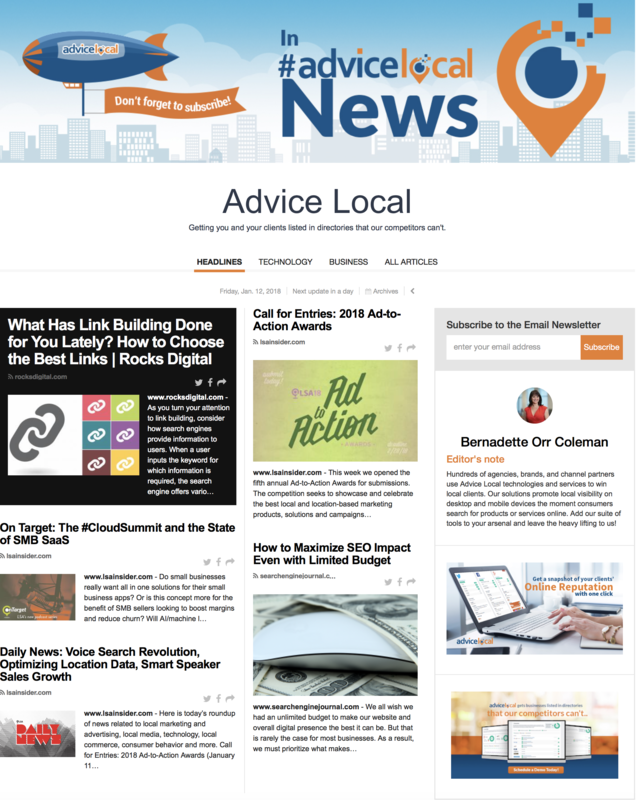 Advice Local has a pro account for Paper.li which we use to curate content to a subscriber base. We have customized ours so it pulls articles via RSS from trusted industry and partner sites. While we are not personally selecting each article that appears in the paper, it does have some filtering in place because we have customized which sources articles are pulled from. Here is an example of what our Paper.li looks like. Personally, I would recommend — if using a tool such as Paper.li as the primary method for content curation — that it is monitored closely and adjusted regularly. While we use it for Advice Local, it does not email to our complete email list, and is simply used to gather content for readers who have subscribed via social media after we shared it. Wow! It’s been quite an adventure moving through the various aspects of content curation! How do you feel? Are you currently curating content for the local businesses you represent? Are you going to add content curation to an existing content marketing plan? We’ve covered a lot, and we’re ready to help you. Our partner solution includes content marketing. Request a demo today and learn how our all-encompassing local presence management platform is the perfect partner solution.